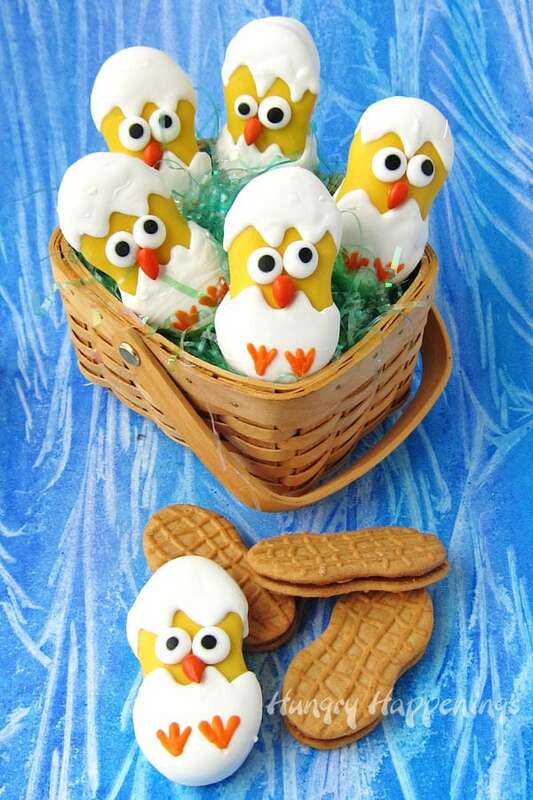 This Easter fill your baskets with these adorably cute Nutter Butter Hatching Chicks. Each white chocolate coated cookie is decorated to look like a baby chick popping it’s head out to greet the world for the first time. Hi everyone, I’m Beth and I blog over at HungryHappenings.com. 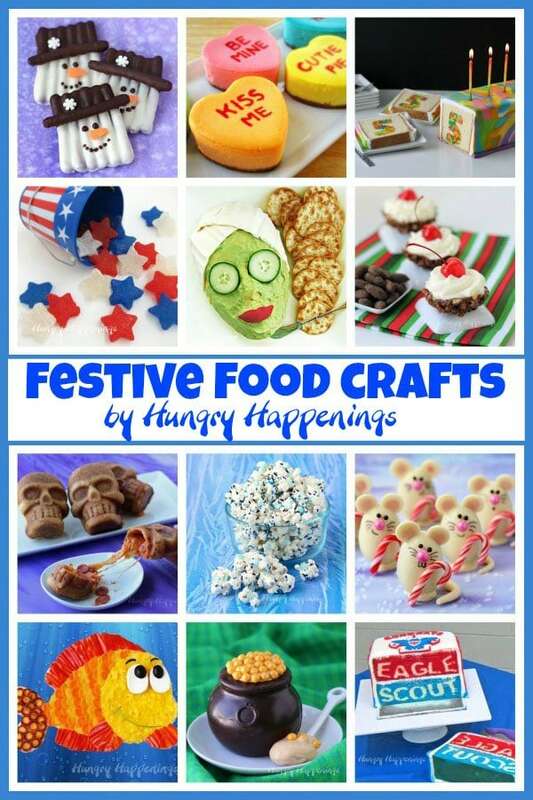 Each week I share a few step-by-step tutorials to show my readers how to transform ordinary food into festive and fun treats and snacks for holidays and special occasions. I do my best to show very detailed instructions, so anyone can recreate my projects in their own home kitchen. I have been a chocolatier for over 30 years and share lots of tips and tricks with my readers. 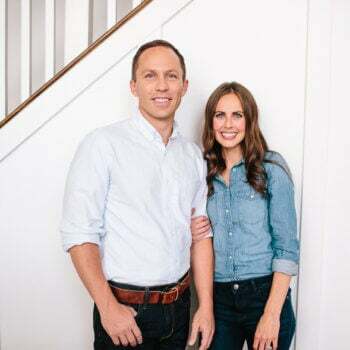 If you don’t have much experience working with pure chocolates including milk, dark, and white, or with confectionery coating, also known as Candy Melts, Candy Coating, Melting Wafers, and Melting Chocolate, I offer a great resource filled with very detailed information. My Chocolate Making Tips page will walk you through the steps to choose the right chocolate for a project and show you how to melt it and use it in recipes. You’ll learn how to color chocolate, how to paint it into molds, and how to transform it into a soft clay that can be sculpted into anything your heart desires. 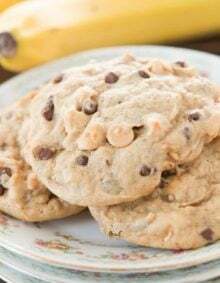 Although many of my recipes are made using chocolate, I also create food crafts using cakes, cupcakes, cookies, cheesecakes, fruit pizzas, caramel apples, and doughnuts. I even create savory snacks including fun cheese balls, shaped chicken nuggets, cool calzones, and more. One of my most popular recipes is for Crescent Roll Carrots filled with Egg Salad. It’s a wonderful recipe to make for Easter brunch or lunch. 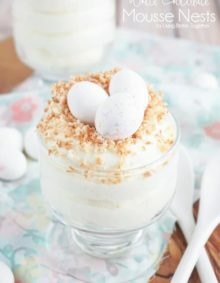 Today, I’m here to show you how to make a sweet treat for Easter. Every year, I make Easter chocolates to sell to customers, and one of my most popular treats is a lollipop that is shaped like a chick hatching out of an egg. 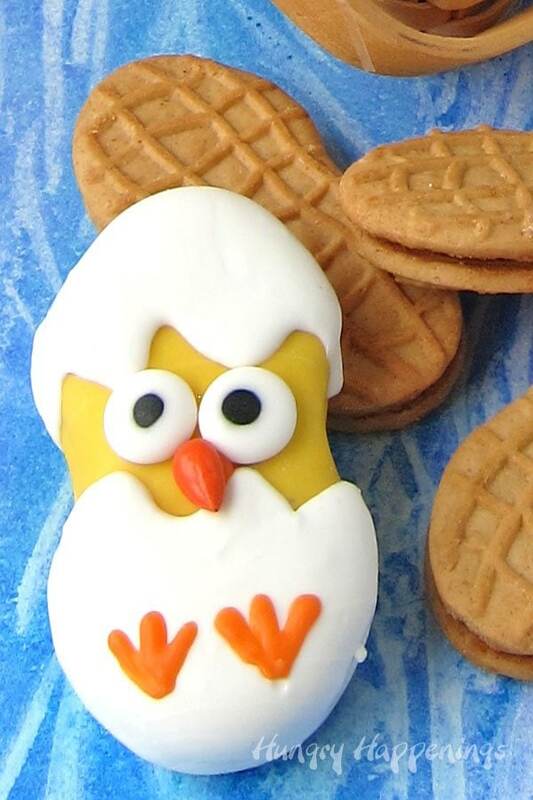 I’ve always thought the shape of the lollipop looked like a Nutter Butter cookie, so I put the candy mold aside, and created a cute baby chick using the cookie. 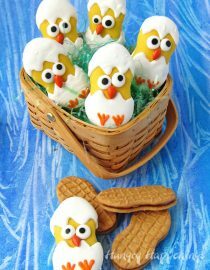 To make these chicks you can melt, temper, and color pure white chocolate or use white, yellow and orange candy melts, which is what I chose to do. To melt the candy melts, place them in a microwave safe bowl and heat on high power for 15-30 second increments stirring after each, until melted. 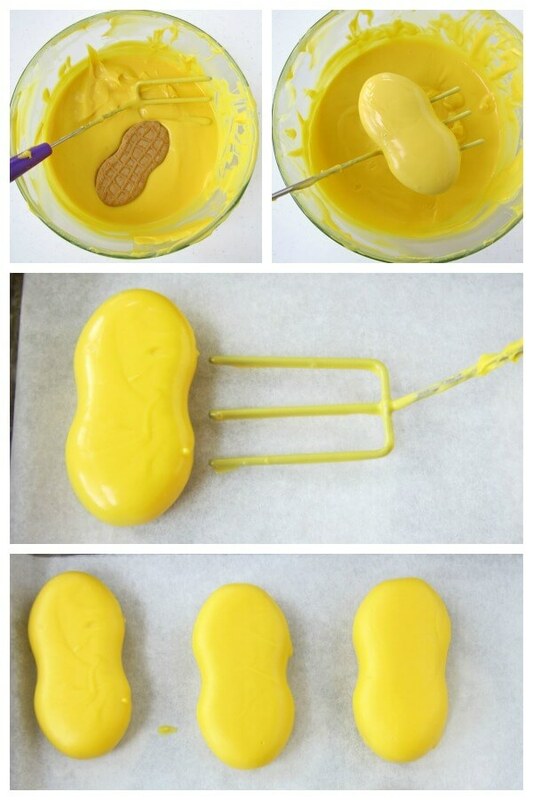 Dip a Nutter Butter Cookie into the yellow candy coating and remove it using a dipping fork or a kitchen fork. Allow the excess candy to drip back into the bowl, then set the cookie on a parchment paper lined baking sheet. After you’ve dipped a few cookies, place the pan in the freezer for 5-10 minutes until the candy coating hardens. Remove and let the cookies sit at room temperature for at least 15 minutes before moving on to the next step. If you dip an entire tray of cookies and let them sit at room temperature, you may get white streaks and spots on your yellow candy, so do a few at a time. If you leave them in the freezer too long, they will get sticky and may even crack, so be sure to take them out once hardened. Now your chicks are ready to get their shells put on. 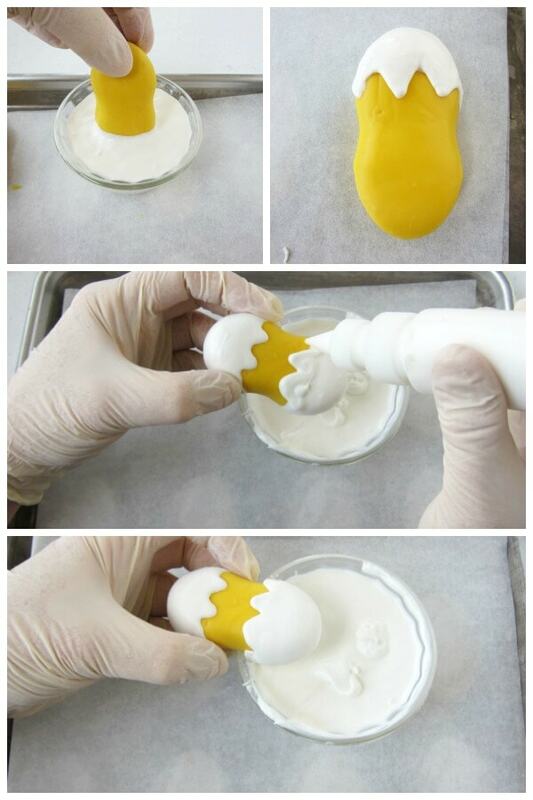 To do so, dip one end of the yellow cookie into white candy coating and create the cracked shell. You can use a paint brush to paint on the points of the cracked shell or you can pour some of the white candy coating into a squeeze bottle and pipe on the shells. I piped them on, then piped more candy over top of the area I dipped, then tapped the cookie on the edge of the bowl to allow the candy to slide down over the edge of the cookie, leaving a nice flat candy shell. 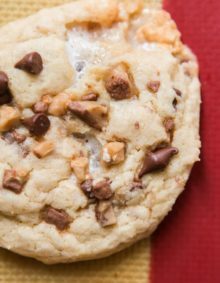 Pop those cookies into the freezer for about 5 minutes until the candy coating hardens. Once again, allow the cookie to warm up to room temperature before dipping the other end and creating the other side of the egg shell. If you try to dip a cold cookie, the candy coating will harden too quickly and you won’t be able to get a nice smooth shell. Freeze the cookies again after you add the final part of the shell. Attach two candy eyes and one candy coating orange sunflower seed beak to each chick using some melted candy coating. 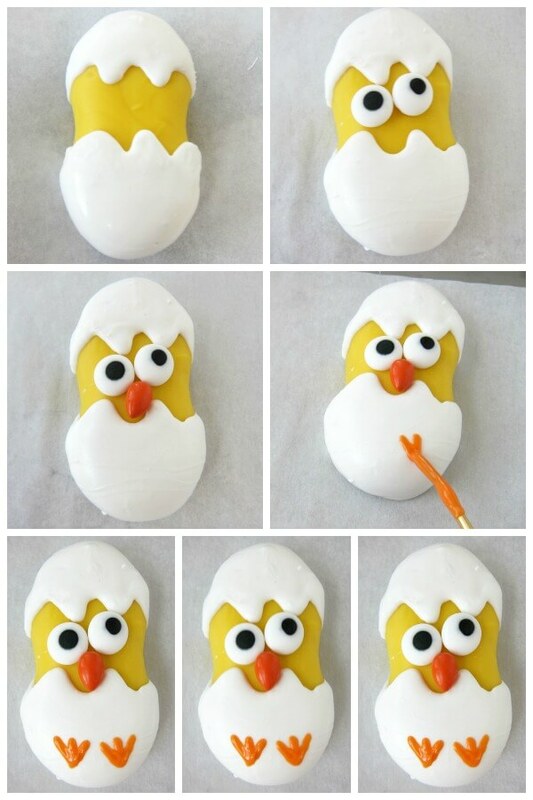 Then paint two feet onto each chick using orange candy melts using a food use only paint brush or a toothpick. 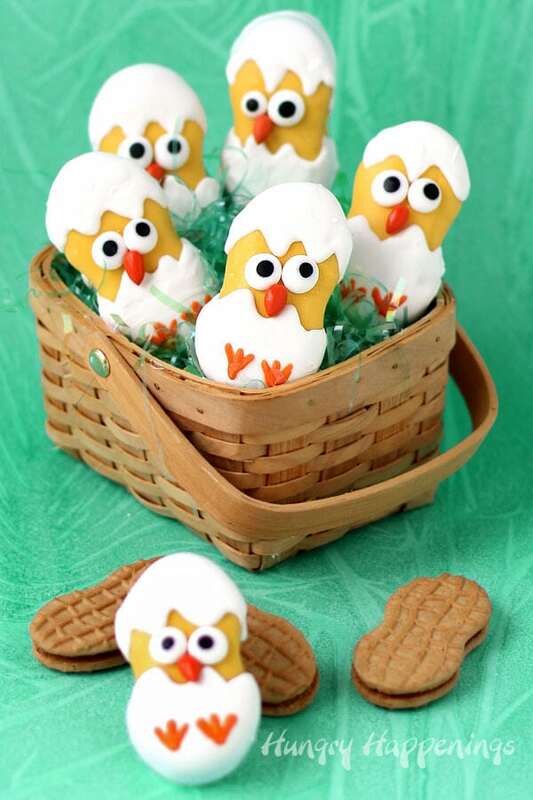 Pop in the freezer for a minute or two and your hatching chicks are ready to make an appearance in your Easter baskets. 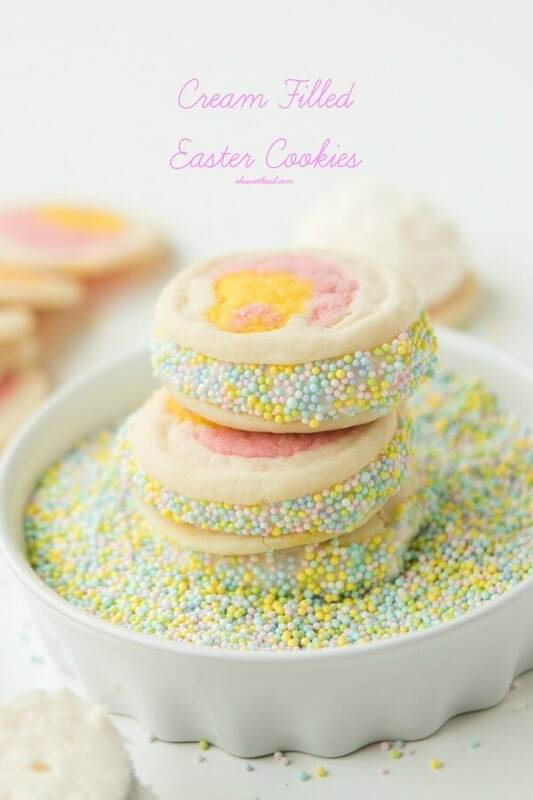 These Easter treats will keep for up to 3 weeks if stored at room temperature in an airtight container. Dip Nutter Butter cookies in yellow candy melts. Set on a parchment lined baking sheet. Freeze for 5-10 minutes until the candy coating hardens. Allow cookies to warm up for 15 minutes. Dip one end of each cookie in white candy melts and paint the candy coating into points so it looks like a cracked egg shell. Pop in the freezer for about 5 minutes until the candy coating sets. Allow the cookies to warm up for 15 minutes before dipping the opposite end creating the cracked egg shell look. Freeze one more time for about 5 minutes. 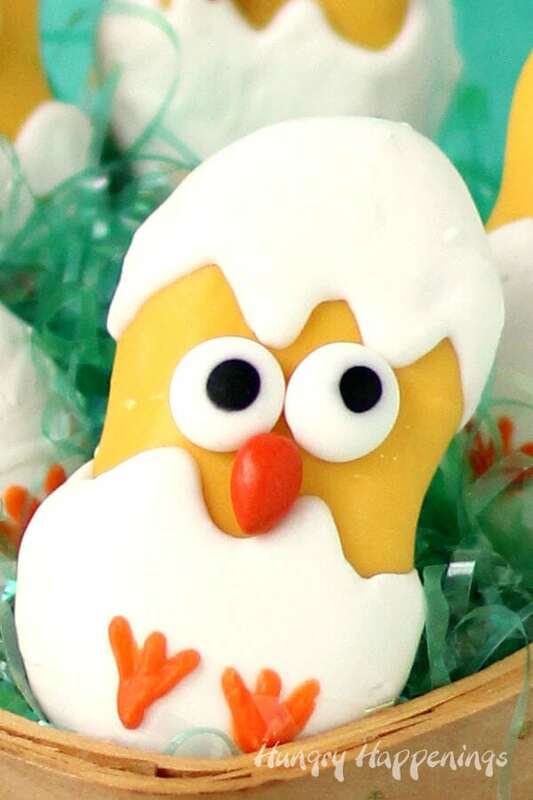 Remove and use candy melts to attach two candy eyes and one beak onto the yellow part of the Nutter Butter Chick. 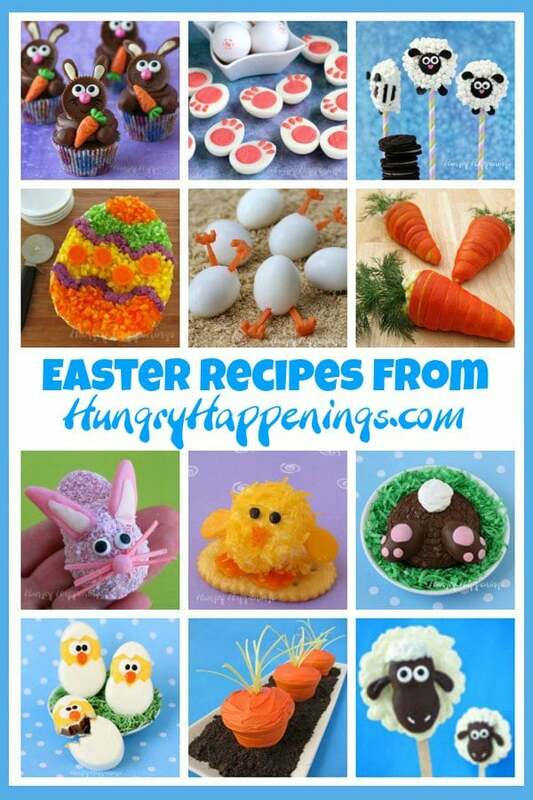 Be sure to stop by Hungry Happenings and check out all my Easter recipes. Not only will you find adorably cute sweet treats, you’ll also find lots of savory food art for the holiday. 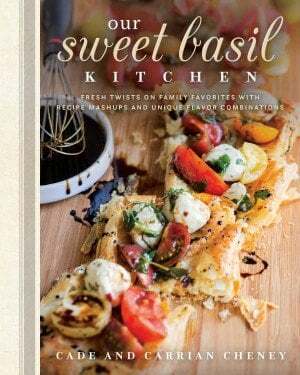 You can find every one of my fun food projects pictured on my Recipes page. You’ll see ideas for every holiday and lots of special occasions. Just a note, the page currently has over 800 pictures, so it may take a minute or so to load them on onto your screen. Don’t let that stop you from checking them all out. I’m sure you’ll find some fun treats to make. Thanks to Carrian for inviting me to share one of my fun food ideas with you all. 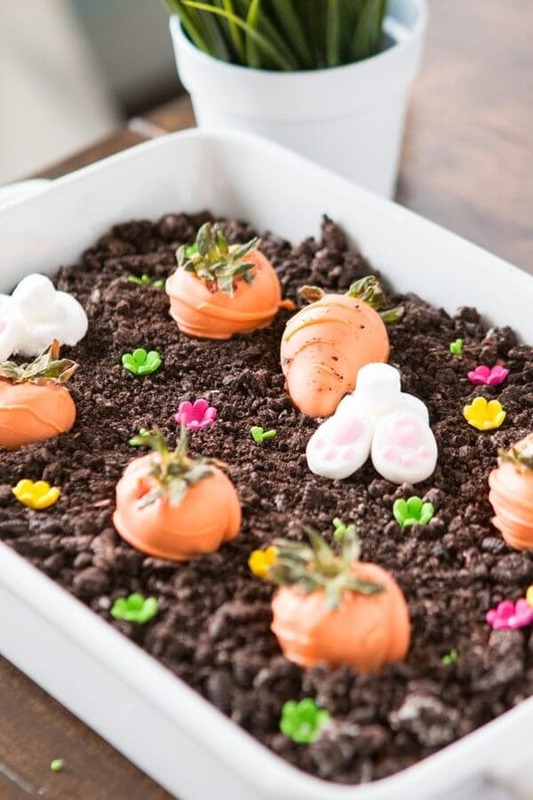 She has created a few fun Easter treats too so be sure to take a peek.